Core offers a unique combination of water, silicones, and acrylic copolymers that kills foam quickly. 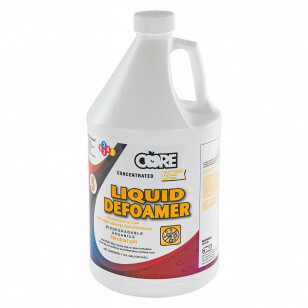 2 ounces of this liquid, taken directly through the vacuum hose, for every 5 gallons in the recovery tank will effectively prevent foam from building up there. Why kill foam in your recovery tank? Too much soapy foam in the tank will be taken into the motor and eventually cause breakdown of that motor (and a costly repair). Better to prevent the foam in the first place. If you need other carpet cleaning solutions we have a full line up for all your carpet care needs, including several carpet extractor defoamers.